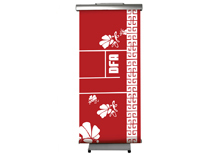 Scrolling banner stands are a great way to attract attention to any booth space. The moving graphic banner makes it possible to display twice the amount of information as a standard banner stand. Using a scrolling banner system will bring more attention to any booth space. Fast turnaround and affordable pricing make these banners ideal for any trade show! Size - 28.75" x 72.5"
Scrolling banners are one of the best options to add movement and excitement to your booth space while still promoting your product or brand. Our select line of scrolling banners are made with high quality, durable materials so they will last for years of use. Our endless ad battery operated scrolling banner is a great option for trade shows because it requires no wiring!